As part of their Good Business Journey, Woolworths is proud to support initiatives to conserve Africa’s endangered species. Through partnerships with their customers and conservation organisations, Woolworths is increasing awareness of threats to South Africa’s biodiversity, while actively supporting conservation projects in South Africa. Through the sale of each bag, Woolworths donates R10 to the Blood Lions™ awareness, education and action campaign. This campaign aims to end exploitative lion breeding, petting and hunting on farms across South Africa. 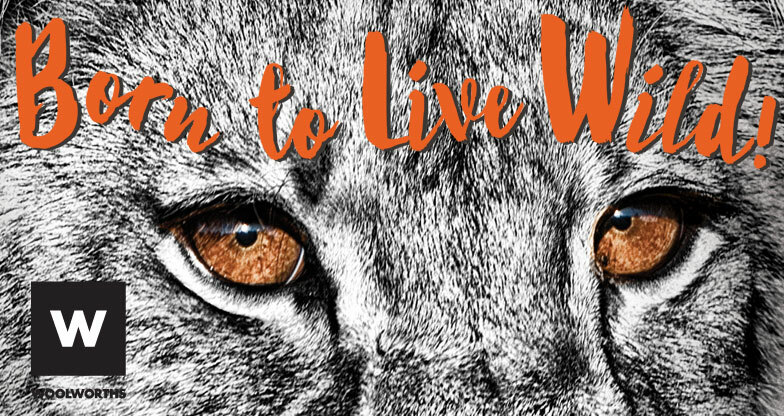 WHAT IS THE BLOOD LIONS™ AND ‘BORN TO LIVE WILD’ CAMPAIGN ABOUT? Blood Lions™ is a documentary feature film that blows the lid off claims made by the predator breeding, cub petting and canned hunting industries. And the campaign is a compelling call to action. Currently, approximately 8 000 predators, the vast majority lions, are being held in cages or confined areas on over 200 farms or so-called sanctuaries across South Africa. But for what purpose? The breeders and hunters make conservation claims; however there is not a single recognized predator scientist, researcher or conservationist that attaches any conservation value to these facilities. They will all tell you that unless under the auspices of a recognized and peer-reviewed conservation programme, the only place for lions and other predators is to be living in the wild. What you need to know is that nearly all of these facilities exist because South Africa still sanctions captive breeding and a variety of exploitative commercial activities using lions and other predators. Canned hunting, which involves the shooting of hand-reared predators in confined areas is the most notorious of these, but the other activities; cub petting, walking with lions, ‘voluntourism’ and the lion bone trade are no less menacing as they have all become integral to what is now a growing industry. If we don’t act now to bring an end to all these horrific practices, the number of predators in captivity could well be over 12 000 within the next few years. The breeders, canned hunters and predator facilities have gotten away with their murky business mostly by giving incorrect and misleading information. To stop this we need to correct the misinformation and tell the world what is truly taking place behind the fences of these facilities. The Blood Lions™ campaign (http://www.bloodlions.org/the-campaign/) has been doing this by addressing all the relevant stakeholders with the aim of bringing about legislative and behavioural change. The partnership with Woolworths and Bags4good specifically targets two aspects of the campaign: bringing greater awareness to school and university students, and then lobbying political and conservation decision-makers to make the legislative changes. 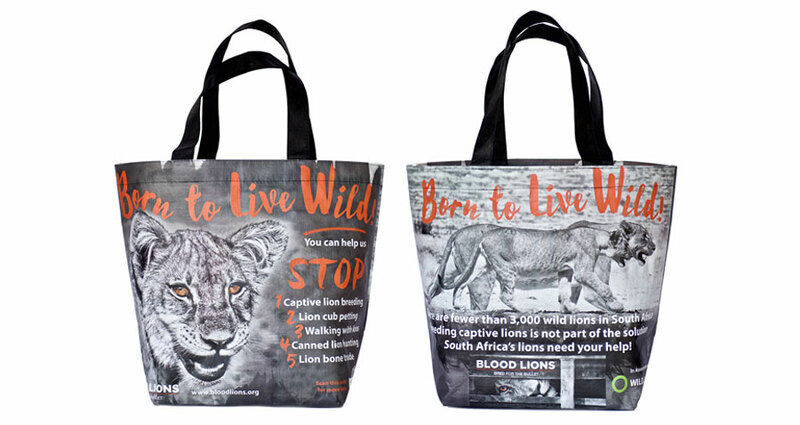 By buying a ‘Born to live wild’ bag you will be making a significant contribution to ensuring the Blood Lions™ film gets seen in as many schools, universities and guide training operations across South Africa. Your donations go to paying for a DVD copy plus postage of the film. In addition, donations will ensure the campaign leaders are able to access the global and local political platforms in order to present the case for change to the decision-makers. Pippa Hankinson: the Producer and inspiration behind the film. Ian Michler: Consultant, Researcher and Lead character in the film. Ian has also been investigating, researching and writing about these practices for almost two decades now. Dr Andrew Venter: Executive Producer and CEO of Wildlands, a leading South African-based conservation NGO that is also the principal partner to Blood Lions™. 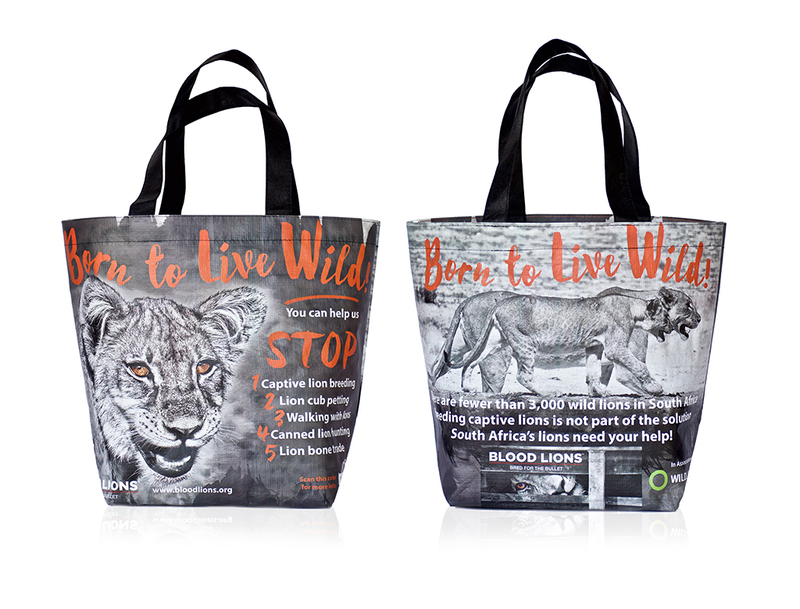 By buying the ‘Born to live wild’ bag you have already made a significant start. 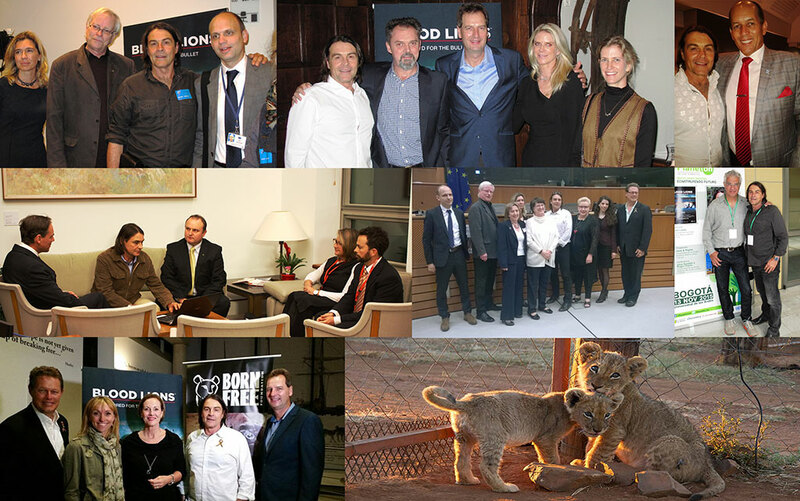 If you want to make a further contribution then recommend to friends, family and colleagues that they see the film and become familiar with why lions and other predators are ‘born to live wild’ (http://www.bloodlions.org/faqs/). In addition, become aware of the real conservation threats predators face and what the legitimate conservation agencies are doing to combat these. The Blood Lions Team has always acknowledged that a wide spectrum of individuals and organizations have made and are still making significant contributions towards dealing with the predator breeding and exploitative activities. The film however has added a powerful visual narrative that has given campaigners around the world an additional tool. From top , left to right: 1. Ian Michler in Euro Parliament 2. Ian Michler and Dr Andrew Venter at Explorers Club in New York 3. Ian Michler with TK Khama, Minister of Environment & Tourism, Botswana 4. Ian Michler presents to Australian Minister Greg Hunt 5. Ian Michler in EU Parliament 6. Ian Michler with Louis Psihoyos at PlanetOn 7. Royal Geographic Society screening in London. 1) Blood Lions has developed and runs a prominent and effective social media platform (https://www.facebook.com/BloodLionsOfficial/) that has reached over 33 000 followers with a reach of over 50 000 people a week. We have been supported by five international tweet storms that have reached millions of participants, and the website (www.bloodlions.org) has had over 103 000 visitors since the end of July. 2) Through the much appreciated efforts of a number of partners, the full-length documentary has been screened 50 times around, including at various well-known international film festivals. 3) Through our distributor PBS International in the USA, two shorter television versions have been aired in over 180 countries or territories by MSNBC, USA and Discovery Networks International. 4) Blood Lions is now available on iTunes and Amazon.com in the USA and on Takealot.com in South Africa (http://www.takealot.com/blood-lions-dvd/PLID41221078). 5) The film has already been screened in the Australian and European Parliaments and is set for screenings in the Italian, Spanish, French and Finnish parliaments this year. In South Africa, Blood Lions has been screened to the Department of Tourism and Department of Environmental Affairs. In addition, the President of Botswana, along with various Cabinet members has seen the film. 6) Australia banned the import of lion body parts into their country in early 2015 (https://www.youtube.com/watch?v=gHaKymPR1-s), and they have now been joined by France (see attached pdf in French) who recently imposed import restrictions on lion trophies. 8) The wider trophy hunting community has certainly taken notice of Blood Lions with engagement taking place at various levels in different countries. 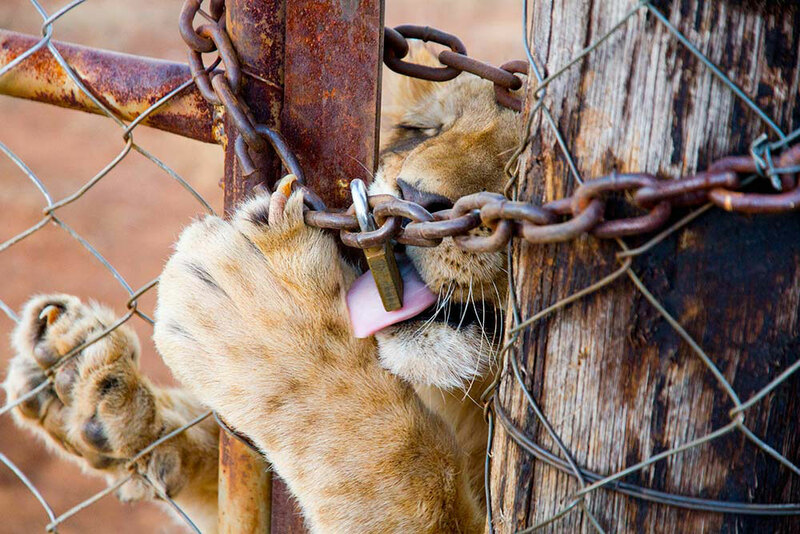 In particular, we welcome the outcome of the recent PHASA AGM (http://www.phasa.co.za/what-is-in-the-news/phasa-press-release/item/682-position-paper-on-captive-bred-lion-hunting.html) where the majority of members voted against captive breeding and canned hunting. 9) Petting and breeding facilities have also begun to feel the impacts of Blood Lions. Due to greater awareness, various tourism companies and booking agencies have begun the process of scrutinising facilities properly and many petting, ‘walking with lions’ and volunteer programmes have been removed from their itineraries and websites. 10) After a screening and presentation in the European Parliament, the Editor of Jäger, the leading German hunting magazine announced that that they will no longer allow the advertising or promotion of any form of canned or captive hunts in the magazine or at hunting conventions associated with them. 11) Blood Lions has received widespread media coverage worth in excess of ZAR15million (approximately US$1million), and has been featured in titles such as National Geographic, Sunday Times, Daily Mail, Sydney Morning Herald, Daily Maverick, Untold Africa and Africa Geographic. 12) And National Geographic listed the Blood Lions™ story as one of the 12 most powerful bringing awareness to conservation, poaching and wildlife trafficking they have published over the last decade (http://news.nationalgeographic.com/2015/11/151107-national-geographic-wildlife-crime-trafficking-animals/). The links below feature some of the global media coverage Blood Lions and its campaign has received since the launch in July 2015.